On these and other pictures the IDF spokesperson responded, "This is clear proof of Israel's repeated claims, that the boat was carrying mercenaries, whose sole purpose was to kill the soldiers." Now when I look at the picture -- no, when any normal, sane person looks at the picture -- I see a soldier being treated for wounds. Even if the wounds were inflicted by some of the Turkish passengers, does this scene look the effect of people "whose sole purpose was to kill soldiers." So I can only conclude that either the IDF Spokesperson's Unit is made up of babbling idiots -- and I know that not to be true, from personal acquaintance -- or that it simply assumes that most people will not bother to look at the pictures and that it can say what it likes. The scariest possibility is that some people look at this picture and see the bald-headed fellow trying to kill the commando. If such people exist, then they make holocaust deniers seem eminently reasonable in comparison. 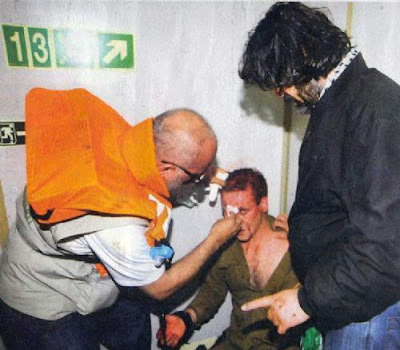 Why isn’t the Israeli commando talking about how he was treated, as portrayed in the picture? The IDF spokesperson said "that the boat was carrying mercenaries." Never did the spokesperson say that all of the boat was filled with mercenaries, but instead that it was simply carrying mercenaries. To me it seems as if these pictures are just evidence of how badly Israeli soldiers were beaten up (but maybe I am wrong). Also, I agree with you, it would have been nice if the Isreali commando talked about the treatment he received from the turk in the picture. Greetings. I wonder if you have caught Jacqueline Rose's article in the London Review of Books, J'accuse, Dreyfus in Our Time. If you haven't, I think you might enjoy reading it. Best regards from a neighboring country. actually, the idf said, they were a lynch mob out to lynch the israeli soldiers. Lynch mobs don't normally treat the wounded of the other side. What they were actually doing was defending their boat against intruders. When the soldiers (i think there were two) were hit, the people tried to treat the wounds. The "mercenaries" claim was prompted by the discovery of cash among the belongings of the passengers. So we were supposed to believe that, (1) while those aboard the vessel were filled with murderous hatred, they still required an extra monetary incentive, and (2) they were rather stupid mercenaries who make a habit of taking their money into a situation where they run a very high risk of losing it. Or maybe they expected to buy some things more cheaply in Gaza, having heard that there's a problem with Israel dumping cheap goods in that market. I know that if I were in the IDF Spokesperson Office, I would claim that the Turks were trying to smuggle cash to Hamas (perhaps because they can only get so much in the tunnels at once). why dont you post the pictures of those supposed peace activists standing around the bodies of commandos holding knives? because it doesnt fit your agenda? bacci40, aside from your clear bias, do you have any reason to think that this was a staged photo-op. And even if it was a staged photo-op, whey weren't the Israeli hostages killed when they were at the mercy of the ships' passengers, if that was their aim. I suppose you could reason as follows: "We know that they intended to kill the Israelis because they had sticks and knives." And then I can say, "We know that the Israelis intended to kill the passengers because they had guns." Same reasoning, isn't it. But then you would say, "The fact that they could have killed the passengers but didn't showed that they didn't intend to kill them." To which I would reply, using the same logic, about the passengers. There is nothing in any of the pictures that show that the passengers intended to kill the commandos, which is what the IDF spokesman said. Hell, even if they have automatic weapons, bombs, and grenades, and if they beat up the commandos to a pulp, you would not have reason to believe that they intended to kill them. Unless one was a biased tribalist with the twisted morality of a mafioso. Jerry if you have not followed today's news you should open Haaretz. It is now perfectly acceptable for the liberals and leftists of Jewish extraction to drop any pretences of being Jewish. Just stop pretending that your thinking has anything to do with Judaism or Zionism or whatever Jewish related word you pick. Follow Fahima and admit it - you hate Jews and don't want anything to do with this people. And if you have any courage you will publish my comment. You are not worried when over half the Americans polled do not blame the Palestinians or the activists for the deaths? And this, given that the mainstream media in the US, including the so-called liberal MSNBC, supports Israel's policies in Gaza, demonizes Hamas, and claims, with the US government, that the blockade is legal? Or that the spin was controlled entirely by Israel? I would get nervous about the erosion of support big time if I were you. Ah yes, back to the old humanitarian peace activists argument. At least one report claims the mercenaries intended to negotiate passage to Gaza on the basis of having the kidnapped soldiers. Or do you think that they beat the living daylights out of them with iron bars just because they wanted to present them warmly and caringly to the world later? It makes perfect sense to me that two commandos would be held by the passengers after they were attacked. What is more interesting is whether the Israelis starting shooting execution style after they heard about the soldiers being held down below. In other words, bang bang, release the hostages, bang bang, we're serious. In any event, enough evidence has been released so far to imply that in a six hundred plus passager boat there were no terrorists (Israel made the claim but can't present the evidence "for security reasons") or mercenaries. That the passengers were angry at Israel is also clear, and that some of them were spoiling for a fight seems a reasonable assumption. The truth is we don't know much about anything on the boat besides what Israel has released and what some Turks managed to smuggle out. Except for eyewitness testimony, which Israel supporters discount if they don't like it, Israel has controlled everything, earning it the condemnation of press organizations. 7 of the best trained, toughest soldiers in the world are injured, two seriously, with three of them overwhelmed sufficiently to be taken hostage. 9 regular ol' civilians dead and 34 injured. Do you know people from the Shayetet? I do. That is one tough, nasty training program and those guys go on harsh missions. Yet, here they are with 7 injured. 3 of them actually fell into enemy hands. There would have been far more dead and far fewer injured if somebody wanted to execute others. They probably killed the others at close range, but that's how they were fighting, as the videos show. Do you ever wonder how in regard to anything Israel does, you always ascribe the basest, ugliest, most heinous motives or actions, while excusing their opponents? Anonymous, it doesn't follow from the assumption that Israelis killed some people execution style that their goal was to execute as many people as possible. Why would you think that it does? You always seem to ascribe base motives to the Israelis. I doubt they killed anybody execution style. I think they were in the midst of a battle where some of their comrades in arms went missing and others were beaten and hurt. That's when the real guns came out and the training kicked in. People are beating others a few feet away and you shoot. You see the guy moving his iron bar again, you shoot him again and make sure he's dead. The activists wanted a war and they got a war. Now you want to play the GAME of blaming the Israelis. It's a game. The flotilla was a lie, since the Gazans have a shortage of money not goods, and claiming they were humanitarians when it's obvious there were real fighters there is another lie. Staring at videos where you see people slamming soldiers with iron bars and pretending it's something else is a huge lie and the biggest lie is complaining that soldiers killing people who attacked them is somehow pernicious. And don't think that your smug response to the last comment didn't convince me that you have no answers, because that would be lying to yourself.